Scholarship and Award Recipients to be announced soon! Please note: To ensure that cost is not a barrier to attendance, we offer a sliding scale of $0-$85 upon request. Contact brianj@gsafewi.org to receive more info on sliding scale. Online ticketing is now open! Please click here to purchase tickets or make a donation. Spinach Artichoke Chicken (GF) Chicken Breast filled with Fresh Spinach, Artichoke Hearts, and a Creamy Cheese Blend. Topped with Veloute Sauce. Served with Brown Butter Mashed Potatoes. Portobello Wellington (Vegetarian) Delicate Puff Pastry filled with Fresh Portobello Mushroom, Herbs, Shallots, and Risotto. Served with a Grilled Tomato. Dessert: Golden Carrot Torte Old Fashioned Spiced Carrot Cake Layered with Walnuts and Orange Cream. Topped with Cream Cheese Frosting and a Marzipan Carrot. Do you or a guest have a food allergy that we can accommodate? You can let us know when you register online gsafecol19.givesmart.com or by emailing brianj@gsafewi.org. Please consider bringing a group of friends, colleagues, or students to celebrate with us. You can use our 2019 Table Captain Form to organize! 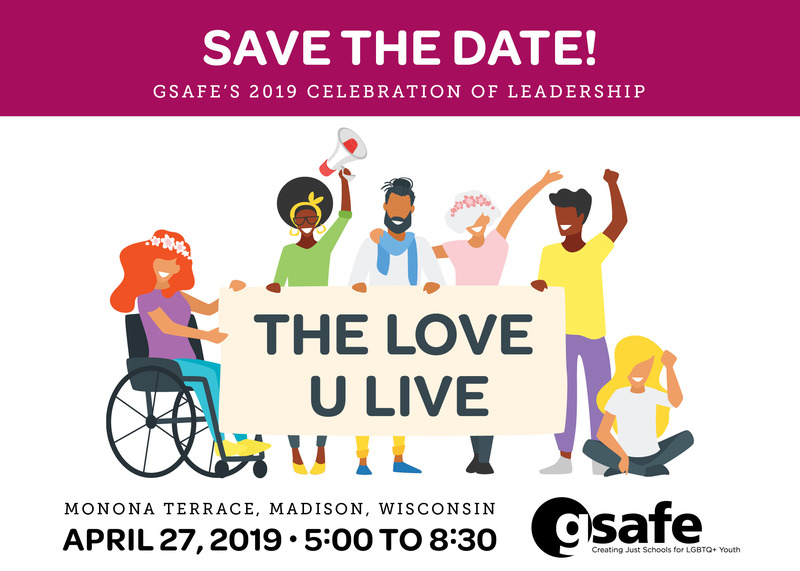 GSAFE has several sponsorship opportunities for Celebration of Leadership. As a sponsor of this special event, you will be publicly recognized and thanked for choosing to invest in our community and in the lives of your young people. Sponsorship opportunity details can be found here. A key part of our fundraising efforts is our silent auction at Celebration of Leadership. We welcome in-kind donations of a variety of items that range in price from $10-$1,000. As a silent auction donor, you and your business will be publicly recognized for choosing to invest in our community and in the lives of our young people. You will also gain business exposure from over 500 attendees. To donate an item to our silent auction, please complete this form.